Bathroom Remodels | Epic Interiors & Construction Inc.
You’ve dreamed for a long time to remodel that bathroom. Choosing the faucets, deciding on body sprays or not, regular bath tub or whirlpool, marble walls or tile walls, new window and where it should be placed. These are just some of the many choices to be made when choosing to remodel a bathroom. 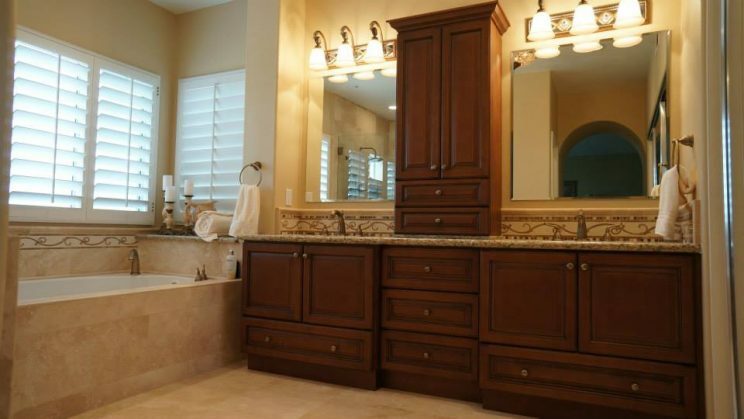 We work diligently to use every inch in the space provided in creating your custom bathroom. Small or large, every bathroom remodel uses only the best material and designs that compliment your way of life. New vanities with storage and a brilliant selection of counter tops and faucets can bring the warm to your work areas. Natural stones, porcelains, ceramics, and customs create a new look to any tub or shower enclosure. Design additions like tumbled tile accents, pencil lines, glass and mosaic liner tiles can help make your new bathroom as unique as you imagined. If you need some inspiration check out the galleries of unique projects we have completed.